Yesterday I left my raincoat at a colleague’s office. Because that coat tends to live in the backseat of my car, it’s out of sight and out of mind until the weather turns sour… which happened to be yesterday evening when I was across town after business hours. Nothing short of magic or a break-in was getting my coat back that night, and I was cold. A distance sensor between my iPhone and my raincoat; it beeps when the coat goes out of range, and shows me its location on the map so it can be retrieved. 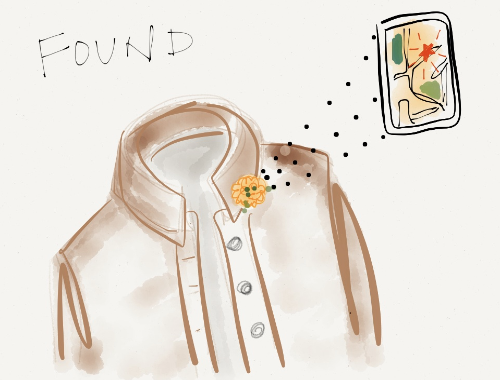 The sensor clips onto the coat with a magnet or as a decorative brooch, and I can turn it on and off with a click (or remotely from the phone if I left the coat at home on purpose). The sensor technology already exists — my car yells at me when the key is too far away while the push-button ignition is on. I have the UX halfway figured out already. If you’re an enterprising mobile developer who wants a fun new project, contact me and let’s talk about it. ← Sing me to sleep.